One billion downloaded songs, wow! This is definitely one big event that Apple needs to mark down. True enough they are marking this, just like what they’ve been doing with the milestones achieved by the Apps Store. 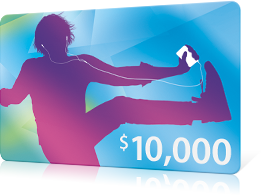 Apple iTunes is holding a contest where you can win a whooping $10,000 iTunes Gift Card. Of course you can only use that card to purchase more songs from iTunes. To qualify for the draw, all you need to do is to purchase a song from iTunes between now and hopefully before the 1 billionth song is downloaded and you will be automatically entered into contest. The winner will be drawn right after the milestone is achieved. But then again, to be entered in the final draw, you need to download a song from iTunes. Like as if you don’t have to pay for it, eh? Anyway, another way by which you can join the contest is by filling up an online entry form. Well, there goes the part that you says you don’t need to download anything. Good enough then. So, ready to take a crack at this $10,000 gig? Fill up this form or download a song from iTunes. Good luck and hurry up as the iTunes Music download counter is winding up to 1 billion. Well, you can download some of the FREE songs, if you want to, and only if you want to, of course.